My day started out pretty crappy. On my way out of the house, I took my BC pill and grabbed the glass of water on my nightstand, only it wasn't water, it was the vodka soda I didn't finish from the night before. Mr. Peachy made it REALLY strong. I love my booze, but just not when I'm not expecting it at 8am. Then I went to school and got a test back that I did not do well on, despite studying A LOT (I hate microbiology!). But then I got in a great workout at the gym and stopped by the grocery store to grab something for dinner. Mr. Peachy has band practice tonight, so I knew I'd be on my own. I got a great deal on a grassfed ribeye steak, so I decided to make myself a fancy meal. Now, I'm sharing the recipe with you, because it is super delicious and Mr. Peachy and I love it. Okay, first you are going to have to make a garlic-herb rub. I promise it is not hard. This amount will last you for lots and lots of steak, and you will want to make this all the time after you try it. It's worth it. I promise. I usually just put it all in a small jar and shake it up. You can skip the fennel (I usually don't have any). That's it. Next, you need two steaks, about 1 inch thick (or half the recipe if you are making yourself a fancy meal like I did). I usually do NY strip or ribeye but the cookbook says you can use T-bone, porterhouse, top blade, or filet mignon too. Anything goes! 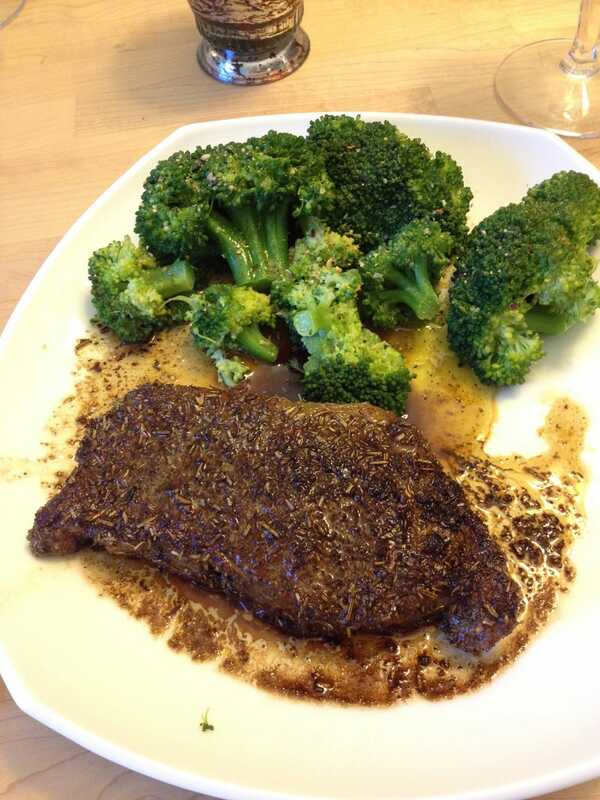 Take 3 tablespoons of the garlic-herb rub and coat each steak. Let them sit out and come to room temperature (30-60 minutes). Then add 2 tablespoons butter and 2 tablespoons of olive oil to a pan over medium-high heat. Once the butter is melted and starts to spatter, add the steaks and cook for 5-6 minutes on each side (they should be medium, adjust time to your liking). Remove the steak. Turn the heat to low and add 1/3 cup bourbon (be careful, it will sizzle!) and simmer for 2 minutes, stirring constantly and scraping up all the browned bits from the bottom of the pan. Top the steaks with the sauce. VOILA, YOU NOW GET A DELICIOUS DINNER! ENJOY!